Donald Healey joined Triumph in 1933 not long after his win in the 1931 Monte Carlo Rally, and was appointed as the company’s technical director. In this role he initially set out to prove his credentials by developing first the supercharged Dolomite Straight Eight and then upgrading Triumph’s production car range of Glorias and Vitesses. Then he developed a new family of four – and six-cylinder engines for a completely new range of cars planned for release in 1936 which would also carry the Dolomite name. These cars were to have a completely new body design, a feature of which was to be a very distinctive radiator grille which the stylist had conceived. 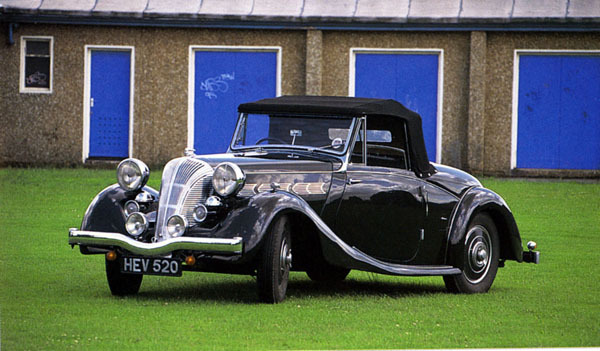 One of the special cars in this range was the Triumph Dolomite Roadster which went into production in 1937 and first appeared on the market in 1938 in rather limited numbers. Although it was described as a Roadster its style was more like a Drop-Head Coupe and it was available in two forms: a four-cylinder 1767 cc model or a six-cylinder 1991 cc model with a longer (2496 mm) wheelbase which gave it a more elegant appearance. The six-cylinder engine had three horizontal SU carburettors and developed 56 kW, giving it a top speed of 128 km/h – enough to make it a useful rally car. On its body the ‘waterfall’ grille, as it was frequently described, was matched to a two-seater front compartment behind which a long sweeping tail concealed a lift-up panel that hid two further ‘dickey’ seats. The car’s appearance was both striking and attractive and with leather trim and wind-up windows in each door and a centre arm rest between the seats it certainly matched the quality of its competitors. Additionally it was well priced. The well-to-do sportsman of the day had a choice between Triumph, Jaguar SS, Riley, MG or several other substantial cars. Elegant by the standards of the day, the Triumph Dolomite Roadster was unfortunately phased out in 1939 early in its life due to the outbreak of World War II and was never re-introduced as post-war Triumphs were really modified Standards.